Today Obama meets with Brewer. Will leadership ensue? By guest blogger, Elisabeth Lesser. 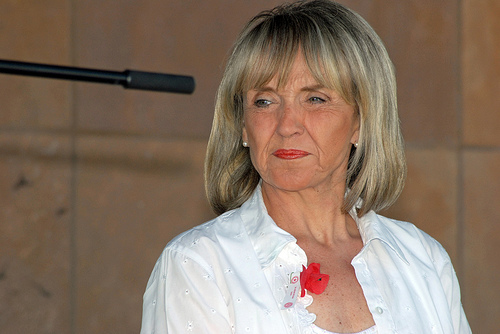 Today, Governor Jan Brewer will meet with President Obama regarding border security and Arizona’s SB 1070. This will be the first meeting between Governor Brewer and the President since the Governor signed SB 1070 into law in April, and the tone set tomorrow by the President will send a clear message about his priorities and agenda in the face of such blatant disregard for social justice and basic civil rights. And even when confronted with proof that her reasons for enacting SB 1070, namely increased crime, are not true, she dismisses the facts and sticks to her misrepresentations. Fortunately, the fight against the startlingly discriminatory Arizona law has been flooding national headlines. Yesterday, nonviolent civil disobedience in New York reached a pinnacle as 56 protesters were arrested, the latest in a campaign of civil disobedience that has led to the arrests of people in DC, LA, Chicago and Seattle. And in Los Angeles County, the Board of Supervisors voted 3-2 to join the Arizona boycott. CCC pledged to join this boycott on May 6th, and you can learn more about why you too should join us here. As we watch the immigration debate rekindle in full force and Arizona strips its residents of adequate civil liberties, it is clear that the people of this country are up in arms, and that the federal government needs to act. Let’s hope the President has heard the united voices against SB 1070 and will finally deliver on his campaign promise to actively reform our nation’s broken immigration system, once and for all. Is this our crystal ball moment? This is what racial profiling looks likes. And this is the mechanism by which Arizona’s SB 1070 will work. With only minutes to go until Governor Jan Brewer’s announcement on SB 1070 in Arizona, thousands of people are gathered in Phoenix to call for justice. The activism and energy being seen right now is further proof that we are fighting the good fight, the right fight, the fight of the people. We are with you in spirit. And no matter what, la lucha sigue. I’ve been getting reports from the ground in Phoenix, Arizona, where thousands of people are gathered to call for the veto of SB 1070. The community is truly coming together around this effort. Earlier today, nearly one thousand local high school and college students walked out of their classes in protest of the bill that would mandate racial profiling in the state of Arizona. The students, chanting U-S-A and carrying American flags, are those caught in the cross-fire of this impending bill. Many of these students represent mixed-status families, who could potentially be torn apart if SB 1070 were to pass. Activists from as far away as Southern California have arrived on the scene, to stand with the protestors in front of Governor Jan Brewer’s office at the capitol. Angelica Salas, Executive Director of the Coalition for Humane Immigrant Rights of Los Angeles, arrived on the scene just as the student protestors were filing into the capitol square. I am blessed to be surrounded by hundreds and hundreds of high school and college students in Arizona. Powerful and gutsy young people walked out of their classes to be here. We arrived as they arrived. We chanted, we marched and now in a circle of unity they share their testimonies as immigrants and children of immigrants. They led an impromptu pledge of allegiance led by a student in uniform. They screamed when they finished ” and justce for all”! Things have to change and they will! And justice for all. We are with you in spirit. In the ongoing vigil to veto SB 1070 in Phoenix, Arizona, today, more than 500 students walked out of a local h igh school in protest of the impending bill. Diana was born in Phoenix. Her parents parents immigrated to the city 18 years ago and have been working hard to provide for their families ever since, despite not being eligible for citizenship. “I get very emotional to see all of the people gathering together for the same cause, to do what’s right for Arizona and veto SB1070”. Miguel has never been a part of of a movement like this and believes that by leaving school he will be able to affect the governor’s decision. He wished he could meet the governor face-to-face to be able to make the case for his own family. 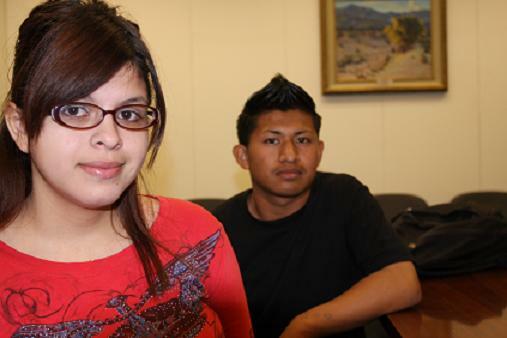 Both Diana and Miguel say tomorrow they will not be going to school as a show of protest against SB 1070. They hope to show Governor Brewer that the current situation is keeping them from obtaining a proper education because they live in constant fear. Fear of having their parents taken away. Fear that their younger siblings will be left abandoned. “If the governor sees that by signing this bill she will be keeping students from school hopefully she will veto it so students can continue to get an education and live normal lives like our classmates”. 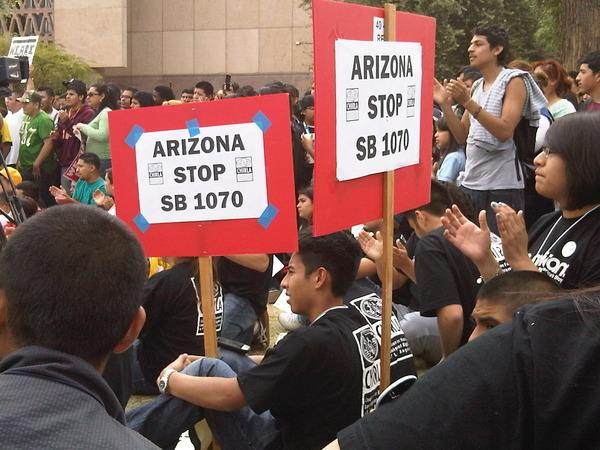 The students plan on keeping from school until SB 1070 is vetoed. 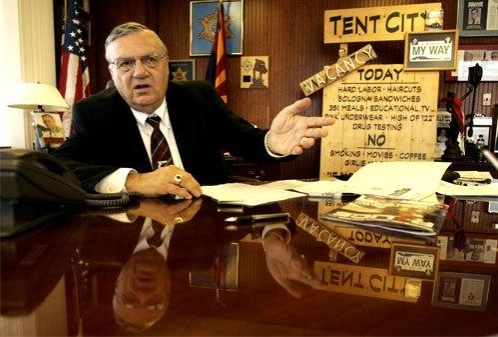 There has been a video circulating the web in the past week that features the story of an FBI investigation that is gathering momentum against our friend Sheriff Joe Arpaio in Maricopa County, Arizona. This weekend, news reports revealed that the FBI is investigating whether Maricopa County Sheriff Joe Arpaio has been “using his position to settle political vendettas” against those who have been critical of his controversial tactics, namely his bullish pursuit of undocumented immigrants. It seems as though Arpaio has decided the same scare tactics and bullying that he uses against undocumented immigrants, could also work against any of his critics or enemies: including those investigating Arpaio’s many alleged abuses. Its worth nothing that Sheriff Arpaio refused to be interviewed on camera for this piece, a remarkable change in attitude from a man who was once gunning (pun intended) for his own reality show and who executes his own press conferences and legal maneuvers with all the pageantry of an actors on stage. Watch this video above, and marvel at how the rogue cop can scoff off two major concurrent investigations by both the USDOJ and the FBI! Methinks hethinks he is his own lil country. And maybe he is. For now. Then again, I bet there was a day the T-Rex thought he’d walk the planet forever. This man thinks he is invincible and that’s not only what makes him terrifying, its also what will eventually bring him down. ACTION: Stop the Circus. Stop Arpaio. In support of the migrants who were chained together and marched through Phoenix by America’s most out-of-control sheriff, hip-hop artists from Chicago, Detroit, and New York are coming together with local artists to perform on Tuesday, February 10 at the Stray Cat 2433 E. University Drive, Tempe, AZ at 8pm. Performers will include One Be Lo, Wordsworth, Verbal Kent, G-Owens, Fiyah Station, Nobuddie, and Bliss! Come out and lift your voices with these artists as they call for an end to the racially-motivated attacks being carried out by Sheriff Arpaio against residents of Maricopa County. Show the world that his latest spectacle of public humiliation against latinos will not be tolerated in our country, where all people are to be treated as equals. We will not stand silent while this fascist little man treats people like animals, with our federal government’s blessing! For more information, contact Jill Garvey (jill@newcomm.org), Center for New Community 312-266-0319 or 773-787-6353 (mobile).